This visualization project was presented in the ITP winter show 2014. It consist in a 3d deformed cube which it shapes with the pass of time. There where two presentation of the project, in one the user can zoom in and out the video with the mouse, and the other one is controlled by the background music. The cons I have with this program is that the minim Beat object should allow a threshold input to control the beat detection ( maybe it exist an I don’t know). Also I want next time import a 3D figure made in other software, because the vertex is not 100% friendly. We picked data of death causes in newyork open source page. For this project I did exercise 16-2 from the book “Learning Processing”of Daniel Schiffman,,, and instead of drawing the image shown with ellipse i change it for squares. I used for this project the example of the JitterBug from the book “Getting started with processing”, where i added the circular movement and the change of color when moving the mouse. I wanted to do something like this to see how the change of color in one array makes you think the other also changes. For this assignment i divided the draw part of last “egg program” into functions. The variables that you can change in draw are the color of the sperms and the maximum size that the egg grows when mouse is inside. mouseInEgg(200); // you can tell maximum radius of the egg. we decided to use sine function to code sperms trying to reach a ovary, and to make it more interactive something happen when you put the mouse inside the ovary. 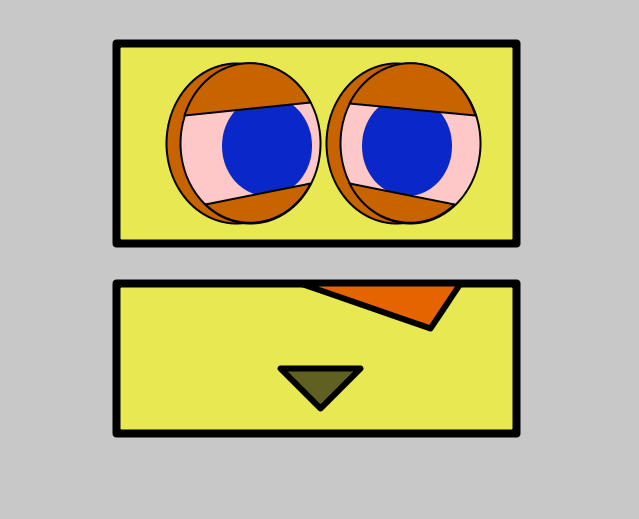 For the second ICM project, i decided to animate my first project, the dude,…. so you can interact with the cartoon using the mouse (Y position, up and down). Also while time pass there are stars appearing in the background. heres the link to see the animation. addeye=map(1, 0, 40, 0, QUARTER_PI);//calculates the value to be added for the eyelids to close at same time as the mouth is moves. //opening mouth, close lids, make eyes red when mouse goes down and stopping at a point even if mouse keeps going down. //closing mouth, open lids, making eyes white when mouse goes up and stopping at a point even if mouse keeps going up.